It’s not as terrifying as you think! The idea of using ink in a primary or elementary classroom may conjure terrifying images in your mind of spillages, stained clothes, and smudged artworks. 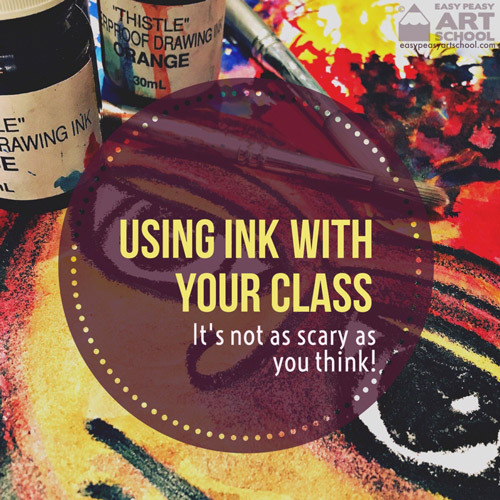 But with a little caution and a bit of preparation, ink can prove to be a wonderful art medium for your class to draw, paint or experiment with. I’ve used ink for years in my teaching. From Year 6 all the way down to Kindergarten and even special education classes. All of my students have loved the experience of using ink to create artworks. One of the benefits of using ink is its ability to help in the teaching of brush technique. You can paint much longer, thinner or thicker lines and all with one brush when using ink. Ink can also be used beautifully when teaching students about value – light and dark in an artwork. Students can mix ink with varying amounts of water or other colours to create lighter or darker shades in their work. You can also use ink with different painting and drawing implements. You can paint with a brush, draw with a nib or stick and even blow ink with a straw to create different effects. It’s ability to be used as both a drawing and painting medium can really help in adding more detail in a painting rather than when you use paint. What type of Ink should I use? Ink comes in different types but with younger children you should use water based drawing ink. It is easy to mix with water and easier to clean up. You can get ink in many different colours but sometimes it’s great to use just one colour mixed with water or white ink to create monochromatic artworks. Any type of brush works, but I like to use a soft bullet tipped brush. A size 6 works beautifully for both thin and thick lines. You can also paint or draw with larger brushes and even wooden food skewers are great for adding thin scratchy lines. Although ink can be amazing, you do need to take some precautions. Place small amounts of ink in paint palettes or ice cube trays. Ink goes a long way, so you don’t need much. Ice cube trays or palettes are also great because the students can mix new colours. Place small bottles of ink inside larger containers to prevent them form being knocked over. Ensure your class is wearing paint shirts or aprons. Table covers or newspaper are a necessity. Ensure that students clean their hands and brushes throughly when competed. Don’t be scared of ink. It’s well worth the precautions and a touch of pre-lesson anxiety!